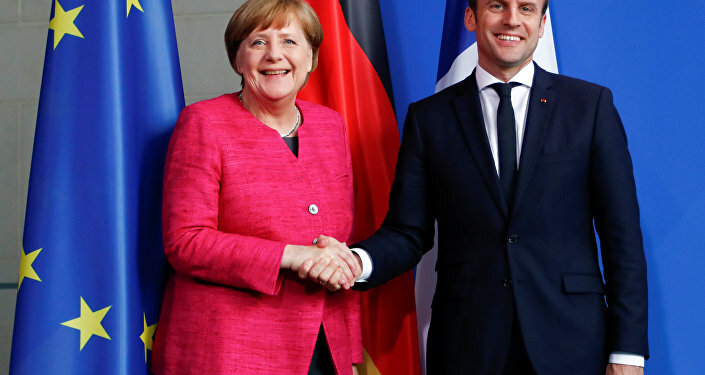 Berlin and Paris are discussing reforms which have taken place in the EU since the election of French President Emmanuel Macron in 2017. In November, Macron underscored the necessity of implementing a "profound reform" of the EU, which he said was specifically caused by Brexit and should be for the benefit of citizens of the bloc's member states. Speaking to the regional public broadcaster RBB on Monday, former German Finance Minister Wolfgang Schauble called for a full-fledged reform of the EU, which he claimed should have a common budget and finance minister. Schauble urged the EU member states to agree on uniting revenues and more finance policy competencies before the creation of the post of EU finance minister. "As long as you don't have this, a finance minister alone doesn't make sense. Because then the position is just symbolic, without any powers", he pointed out. Schauble also said that the requirement that all member states need to agree on joint decisions should be rejected, adding that "unanimity means the slowest [member state] can block everything". According to him, a joint agreement should be possible to clinch with 55 percent of member states, accounting for at least 65 percent of the total EU population. Schauble argued that the proposed reforms would be approved by German Chancellor Angela Merkel's conservatives from the CDU/CSU alliance. The interview comes as Berlin and Paris remain at loggerheads over the EU's reform, which France insists should stipulate the block's member states adhering to a common budget and having a common finance minister – a stance that is opposed by Germany. In late November 2018, French President Emmanuel Macron said that the UK's push to withdraw from the EU proves that the bloc is "fragile to some extent, and that there is always obviously a room for improvement". "It finally shows that Europe needs reforms, this is obvious, and I support it, we continue working on it. I believe this is what the upcoming debates ahead of the European elections (to the European Parliament, scheduled for May 2019) should focus on," Macron said. Earlier, German Chancellor Angela Merkel had proposed a new mechanism of electing an EC president, which would include a Europe-wide list of candidates competing against each other; Macron has reportedly voiced scepticism for this proposal. On the other hand, the two favour the creation of a European army and the tightening of border controls and cooperation regarding migration policies. Both leaders want to turn Europe's Frontex border force into a fully-operational border police which will be able to process asylum applications.